Reflecting on the impact of Mark Weiser’s famous article The Computer of the 21st Century (Scientific American September 1991) Paul Dourish and Genevieve Bell show how visions of the ‘proximate future’ influence the technological productions of today. Weiser envisioned a world of invisible technology, where computers blend seamlessly into the fabrics of our everyday lives. In fields of research such as Ubicomp (Ubiquitous Computing), design is based on this future, which is presented as always just around the corner, continuously about to arrive. These effects of science fiction speculation on contemporary technology design extend far beyond fields like Ubicomp. Think, for instance, of the 3D Printer, which is commonly imagined as the first step towards a soon-to-materialize world in which the Star Trek replicator is found in every home. Yet, this straightforward directional narrative - some dream the future and then others go and build it – is complicated in a variety of ways. Many who are involved in the production of technology (whether the shanzhai factories of Shenzhen or ‘the makers’ who gather in hackerspaces and ‘Maker Carnivals’) are driven by a culture of experimentation and entrepreneurship, which eludes any conscious target or goal. Rather than a wholehearted embrace of the new, they celebrate a past of craftsmanship and a DIY ethos laden with nostalgia for the local, the homemade and the re-used. On a more outlandish note, one of the most common tropes of Science Fiction involves the creation of intelligent machines whose very emergence already implicates the past. For instance, in both The Terminator and Neuromancer, artificial intelligences reach back in time to enable their own fabrication. Reflecting on these Sci-Fi narratives, we may speculate that today’s makers are not in control of their own creations. Rather than the present leading to the future, it is the machines of tomorrow that are directing the productions of today. Chris Anderson, the former editor of Wired Magazine and author of the book “Makers: The New Industrial Revolution,” argues that “everyone can build a factory today” by leveraging labor and expertise built up in regions such as Tijuana, Mexico, and Shenzhen, China: “Tijuana is the Shenzhen of North America. Mexico graduates more engineers than the US. So we hire these people and people who spent the last 10 years working for Foxconn. That’s the secret to doing manufacturing in North America.” While Anderson shows that a maker approach can revitalize particular economies, the arrangements he suggests also reproduce already existing power relations between a relatively affluent class of technology producers and the workers of so-called “developing” regions. Meanwhile, manufacturers and makers in China provide alternative visions of China’s role in this contemporary remake of industrial production and hardware innovation. They challenge the conception of China as simply the supplier of cheap labor or the core asset for the resurgence of the American economy. Over the last years, regions such as Shenzhen have witnessed the emergence of new partnerships, for instance between hardware start-ups, makers, factories, and educational institutions. We see this reflected in a growing number of hardware accelerator programs based out of Shenzhen or governmental initiatives that support maker spaces to teach technology design and development through hands-on learning. Shanzhai (山寨), translates literally as ‘mountain village’ or ‘mountain stronghold’ and has strong subversive connotations. In contemporary (originally Cantonese) slang shanzhai refers to the cheap knock off goods produced by small, low-quality factories in southern China. It is rooted in the fiercely autonomous SEZ culture of Guangdong. Shanzhai, many note, sounds a lot like Shenzhen. At first shanzhai referred almost exclusively to mobile phones, a device that has a special affinity with disruptive technology in the developing world. Shanzhai ji (bandit phones) came into existence in 2005, the year that Mediatek, a semiconductor design company from Taiwan, introduced an innovation that significantly reduced the cost and complexity of producing mobile phones. Since then shanzhai phones have mushroomed, capturing an enormous share of both the domestic market and also of emerging markets in Asia, Africa, the Middle East and South America. Shanzhai manufacturers are slowly making the shift from imitation to innovation. The mutation was not intentional. Due to shanzhai’s uniquely rapid production cycle, companies have been forced to innovate simply because the branded companies are too slow to come up with new products to copy. When there is nothing left to counterfeit, you have to try to come up with something new. 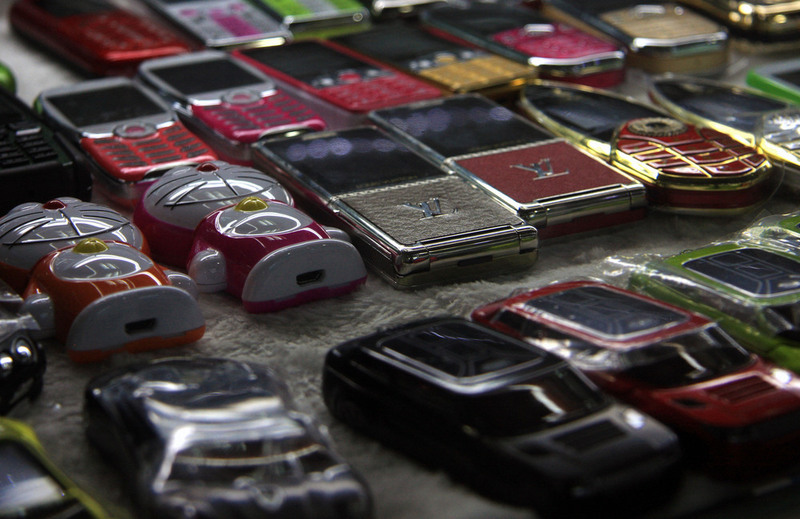 Today shanzhai has extended beyond its origins in the manufacturing of cell phones (shanzhai ji or bandit phones) and has now come to designate a DIY, grass-roots ethos that has spread virally to constitute a creative culture of the street. Far more than cheap, fake phones, the informal factories and markets of shanzhai production has links to contemporary maker culture and has become the shadowy twin of ‘open innovation’ and thus constitutes one of the great counter-currents of contemporary technological mutation. The contemporary landscape of information technology production is one that has been profoundly influenced by the emergence of so-called “hacker culture” in the 1960s and 1970s. From Mac OS X to Android, from TiVo DVRs to Linksys network appliances, from Amazon.com to Google Chrome, the technology landscape is full of products that depend upon alternative models of production than that of traditional industrial engineering. These alternatives are variously known as “open source,” “open innovation,” “peer production,” “free software”, and the like. The countercultural view of the original hacker movement depicted the emerging digital world in revolutionary terms and as antithetical to the technologies and social structures powering the Cold War state and its defense industry (see for instance the work by Chris Kelty 2008 and Fred Turner 2006). Members of this so called “hacker culture” were committed to designing technologies open and modifiable by their users. Their approach towards technological “makings” evolved out of an “orientation toward the computer as a tool of empowerment and discovery” (see Mimi Ito 2009 and Steven Levy 1994). Fifty years later, we find ourselves in the middle of a new hacker movement (or “maker movement”) that both harkens back to earlier hacker culture and departs from it in significant ways. It is rooted in a growing network of hackerspaces that expand the ideas and practices of the Web generation into hardware and manufacturing. Hackerspaces are shared studios that bring together people engaged in building creative technical projects through the free and open sharing of equipment, tools, software and hardware code. The origins of the hackerspace movement lie in Europe, where the first hackerspace c-base opened in 1995 (Baichtal 2012). About ten years later, the movement began to flourish in the United States with NYC Resistor opening up in New York in 2007 and Noisebridge in San Francisco in 2008. Two years later, in Fall 2010, China’s first hackerspace XinCheJian opened in Shanghai, introducing concepts such DIY making and open hardware to a wider audience, which quickly expanded into a large community of passionate DIY makers that now spans six hackerspaces across six cities (Lindtner and Li 2012). Today, with an estimated 700 to 1,100 active spaces in existence worldwide, hackerspaces are a significant global phenomenon (see the hackerspace wiki for more details). Like the hackers of earlier decades, they are committed to a deep understanding of the inner workings of technology, the free and open sharing of code, critical reflection and engagement with a wider public, and peer production. At the same time, the contemporary movement also extends and in part remakes earlier hacker practices and ideologies. While the first hacker movement redefined the production and use of digital things and software, the hackerspace movement today is committed to redefining the production and use of physical things and hardware. Just as Web start-ups and the Bay Area counterculture drove aspects of new technologies and IT culture, so is the contemporary hardware-focused start-up and hacker culture positioned to reinvent manufacturing and innovation in production. Cybernetics is defined as the science of communication and control in animals and machines. Hacked Matter’s most recent field of investigation is on the border-zones and intersections between biological and technological systems. At the socio-economic level this tracks a rise in automation that is reshaping the factory and workplace and is changing the way we are living with machines and also make a living off making them. More intimately, it explores interconnections between the body, electronics, and technological visions of the future as we move beyond touch screens and wearables to the embedded machines that live inside us. In addition to these cyborgian becomings, this investigation looks to the growing fields of robotics and AI as systems of spontaneous emergence that, ultimately, breed machines which come to life. Living Machines also explores the role of open source and peer production in areas such as genomics, QS, and biotech writ large. It examines biotech both as large-scale genetic engineering and DIY maker culture. We investigate, for instance, how players such as the world’s largest genomics organization BGI, based out of Shenzhen, China, come together with makers invested in Open Science and DIY Bio.